HOLT Architect’s home office and studio space in Ithaca, NY had become outdated and was no longer able to fully support the technical or collaborative needs of HOLT's employees and their practice. Rather than investing in a renovation of the space that they were leasing, the firm opted to purchase an older structure at 619 West State Street in the West End section of Ithaca that is focused on growth and revitalization. Here they could create their new home office that truly represented both their business and their values. The location was close to local businesses and restaurants, public transportation and major roadways, nearby parks and the waterfront. Perfect! For the 7,600sf of the structure to become HOLT’s new office, it would need a new exterior aesthetic, a complete interior gut renovation, all new mechanical systems, updated and enhanced building envelope, and a new roof that would be designed to meet the needs of their net-zero energy use goals. Working to preserve and highlight as much of the original structure as possible, HOLT saved the interior ceiling and roof structure and partially saved and modified the windows, building entry and exterior brick. Sensitive architectural moves that helped transform the existing brick and two-toned stucco strip mall into an efficient and contemporary office building also included removing the false pediments from the rooftop, covering the two-toned stucco with metal paneling, and adding color, signage, light monitors and skylights. Photovoltaic Arrays: HOLT’s PV array is a grid-tied electrical production system. Grid-tied means that when the office is producing more energy than it is consuming, the excess electricity is being put into the utility grid rather than being stored in batteries. When the sun is not shining, the office will pull energy off the grid. High-Performance Envelope: A high-performance envelope is imperative to keeping heat/cool air from leaving the building, and is one of the most important factors in high-performance design. The building’s existing envelope consisted of uninsulated CMU block walls; and HOLT’s unique envelope renovation solution of putting continuous insulation on the inside of the block and in the stud cavity helps keep all of the energy inside. Natural Lighting: Skylights greatly minimize energy use by harvesting natural light deep into the building. While the majority of employees in the studio have direct access to outside light, the private offices and collaborative zones achieve it through skylights and clerestory windows. Artificial lighting: Using LED lighting is a great way to reduce energy consumption -- and lighting controls such as occupancy sensors, daylight sensors, and scheduling software, assure that energy is invested in lighting only when and where it is necessary. In private offices the lights automatically turn on at 70%, leaving it up to the user to adjust the control if more light is needed. Plug loads: Plug load control hardware allows control of power receptacles by occupancy or time of day. In the HOLT studio, the plugs shut off at 7pm so that all monitors and chargers power down for the night (unless overridden for late night work)! Mechanical Systems: HOLT’s all-electric, distributed air-to-air heat pump system allows the office to be a carbon-neutral facility. During cooling operation, the heat pump operates as a conventional air conditioner—refrigerant passing through the indoor coil absorbs heat from the space (cooling it), and then rejects that heat outdoors when it passes through the outdoor coil. The refrigeration cycle operates in reverse during heating operation. The facility is not only net-zero energy, but it is also carbon neutral. 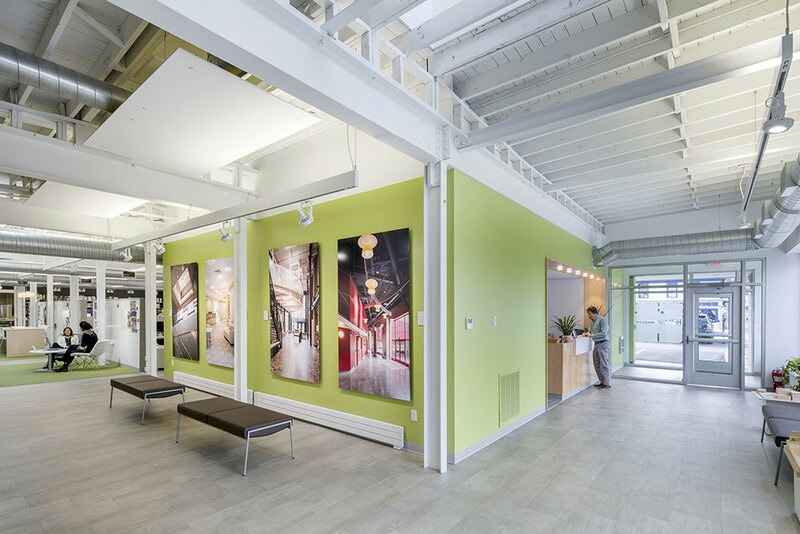 HOLT successfully transformed the aged 619 West State building into a vibrant workplace that reinforces their operational, environmental and aesthetic mission. The design juxtaposes crisp contemporary architecture with the original structure of the building of the ‘60s. One of the biggest community impacts of this renovation is the inspiration that it provides to sustainable-minded business owners. On Tuesday, June 28th 2016, HOLT and 16 other local building owners, community partners, and professional stakeholders, came together to launch Ithaca 2030 District - New York's first! With this, Ithaca joined the ranks of other forward-thinking cities in the U.S. and Canada that are working toward the goal of cleaner and greener commercial buildings. “This initiative will further strengthen Ithaca’s commitment to combat the effects of climate change and spur innovation in our downtown,” said Svante Myrick, mayor of the City of Ithaca. In the end, HOLT got more than just a new building as stated by Quay Thompson, Principal and Project Manager for the renovation: “Having the rare opportunity to design for yourself; to be able to live in it; and to watch how design decisions truly impact your own performance, efficiency, and morale confirms HOLT’s 50-plus year commitment to design as an implementation of beliefs”. Contact Graham Gillespie, AIA at 607-273-7600 ext 130 or GG@HOLT.com for more information.